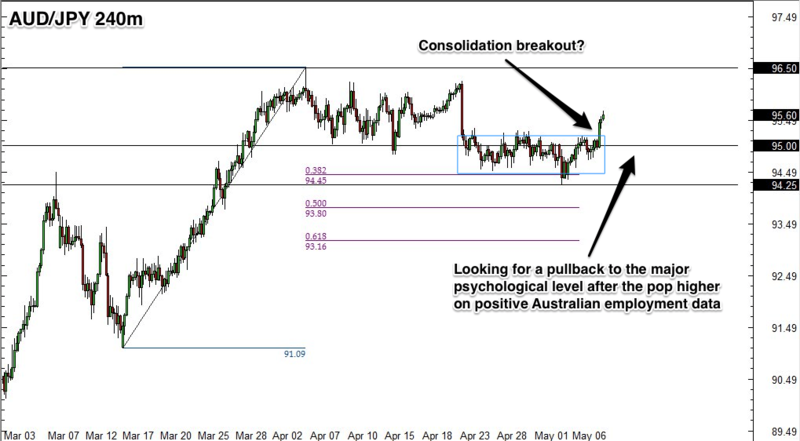 AUD/JPY Set to Move Higher? I’ve been watching this forex pair for a a week or so, and now that we’re past some key data points for the Aussie, I’m ready to jump in. Early in the Asia session, we got fresh Aussie jobs data showing a net positive change and a tick lower in their unemployment rate to 5.8%. Currency traders quickly went into buy mode on the Aussie, enough to break the AUD/JPY out of recent consolidation. I think it’s time for me to get long! Again, I’m bearish on the Japanese Yen because I believe there’s a good chance that the sales tax hike will hurt the Japanese economy down the road, and I’m generally bullish on the Aussie as the RBA is on hold for any rate cuts. This makes Aussie a possible turn around story after being beat up in 2013, the interest rate differential is very attractive, and the positive jobs data could support the currency in the short-term. The risks that I see to these view points is if economic data in China continues to weaken, the Aussie could be negatively affected, and the ever present X factor is the Ukraine-Russia situation. If the latter situation saw an escalation in violence, the Yen could benefit off of risk aversion behavior. I’m only risking 0.50% of my account on this one, and with this trade structure, I have a potential reward-to-risk ratio of about 1:1. I think this is a reasonable R:R ratio as we’ve been seeing a lot of choppiness in the market lately, and because we are heading into a typically less volatile summer season.